Tampin Hill is a popular hiking destination away from the hustle bustle of nearby Seremban city which is approximately 1 hour drive or 60km away. 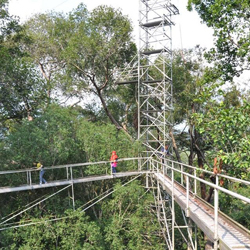 One of the nation’s oldest forest reserve, Tampin Hill is a hill dipterocarp forest thus you will find mature trees. Do look out for flowering and fruiting trees along the walk. Red-throated Barbet, Gold-whiskered Barbet, Scarlet-rumped Trogon, Black-winged Flycatcher-shrike, Grey-bellied Bulbul, Buff-vented Bulbul, Streaked Bulbul, Orange-backed Woodpecker, Grey-capped Woodpecker, Blue-winged Leafbird. The Pasoh Forest Reserve was established in 1974. It is a nature reserve located about 8 km from Simpang Pertang, Malaysia, and around 70 km southeast of Kuala Lumpur. It has a total area of 2,450 ha consisting of tropical rainforest. The forest reserve consist a core area of 600ha of primary forest surrounded by a buffer zone is situated in the Jelebu district. It is one of the research sites of the Forest Research Institute of Malaysia (FRIM). There are over 300 species of birds found in this lowland forest. They include nine species of raptors, 26 species of babblers, 14 species woodpecker, 13 species of bulbul, six species of hornbills and four species of pitta. 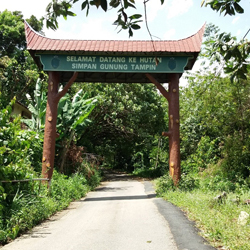 Permission is required to enter the Pasoh Forest Reserve. This can be obtained from the Forest Research Institute of Malaysia (FRIM). Crestless Fireback, Malayan Peacock-Pheasant, White-fronted Scops-Owl, Cinammon-rumped Trogon, White-crowned Hornbill, Green Broadbill, Banded Pitta, Malaysian Honeyguide, Large Frogmouth, Gould’s Frogmouth, Blyth’s Frogmouth.